Here's the idea I have (no plans to implement it yet, just throwing an idea out there). First we figure out the desired fleet movement speed. We take an average, weighted by attack power squared so that if a significant majority of the fleet's offensive power is in fast moving ships, they aren't held back by a slow vessel. We may not even need to ignore immobilized ships, if for example the fleet's centerpiece is a pair of starbases, it may make sense for the rest of the fleet to hang back with them anyways, even if it does mean that the other side gets to shoot missiles at them. Then we figure out the 2D unit vector from our fleet's average position to the enemy fleet's average position. Call it df. Again, it's a unit vector, that's important for the next part. Then, once a ship decides on the x,y position it wants to move to this turn (ds), we shrink it along the axis indicated by df so that df [dot] ds == the desired fleet move speed. That way lateral movements are not affected. It's kind of hacky, since it would be better if this sort of thing was handled by the code that actually chooses a ship's movement goal. But that's in C++, so I think this is the best we can do with a mod. Turns out my idea doesn't work out so well. It involved checking last_event_command()=="end_turn( )" in case anyone was wondering. But the problem is then you just constantly switch between moving one turn and doing nothing the next. harpy eagle wrote: Turns out my idea doesn't work out so well. So did you find out what is causing those idle events? Does the AI currently factor in planetary defense missiles/torpedoes and small craft when evaluating retreat? Maybe it is that it didn't consider that it has lost its interceptors an bombers? zolobolo wrote: Does the AI currently factor in planetary defense missiles/torpedoes and small craft when evaluating retreat? Right now it's pretty simple, the AI retreats all it's forces once the enemy total combat power is more than 3-5x the friendly combat power. It's usually 3x, however if the AI is defending a planet then it's 5x, so its usually a lot more stubborn about retreating when there's a friendly planet present. It doesn't consider anything about the planet, just if there is a planet to defend. Although any defences the planet has will be added to the total combat power score. harpy eagle wrote: It's usually 3x, however if the AI is defending a planet then it's 5x, so its usually a lot more stubborn about retreating when there's a friendly planet present..
One missile destroyer + Carrier vs 2 Heavy Cruisers, 3 Destroyers + PD - and they didn't retreat, only when they lost the destroyer. It should take lost squadrons into the calculation. If you add the following to the bottom of AI\CloseAndAttack.lua, and hit F1, when you save the file you should see a printout of each side's forces, including their attack power, defence power, and combat power. Should the individual fleet attack/defense values be displayed in the console or one of the output files in the save folder? It should be displayed in the console. It's triggered when you save the file, so you may need to add and delete a space depending on your text editor. It also only works during an active battle, not with replays. I don't know how to print to any files in the save folder, but it sounds like it could be useful. harpy eagle wrote: It should be displayed in the console. It's triggered when you save the file, so you may need to add and delete a space depending on your text editor. It also only works during an active battle, not with replays. Or is it the below values? 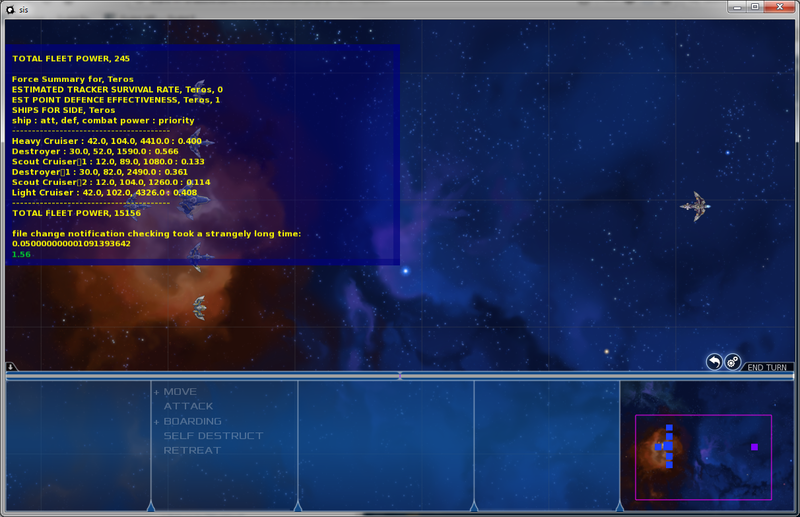 Then when the game detects modifications to the file, it will reload it and run the code I've inserted at the bottom. You may need to scroll up to see it, depending on how many other things are also spamming the console. So they do in fact have more then a third of attack power and also hold a relative advantage in defense, but since they cannot actually do any damage anymore it is a strange situation but the important thing is that the rule works as intended. Replayed the battle a couple of times and they mostly retreat one ship at a time, and it is rare that the situation occurs. Update v1.3 has some significant changes behind the scenes, but primarily adds the ability for the AI to include shield and armor piercing effects when calculating the priority of potential targets. For example, when deciding what to shoot at with coilguns, the AI won't see as much of a difference between a ship with deflector screens compared to a similar ship without deflector screens. And ships with no shields will be high priority for X-ray lasers.